Glenda Volk, left, and Jennifer Bethge, right, demonstrate the use of the Space Labs cardiac monitoring funded by the Wainwright and District Community Health Foundation. This equipment was added as part of a complete renovation of the emergency department at the Wainwright Health Centre. WAINWRIGHT — Residents of Wainwright and surrounding areas are benefitting from a newly renovated emergency department at the Wainwright Health Centre thanks to the Wainwright and District Community Health Foundation. The recently completed renovations added a second trauma room, three larger examination rooms and a dedicated procedure room for casting and day procedures. As well, it doubled the size of the patient waiting area and expanded storage space for supplies and equipment. With donor support, the Foundation funded several pieces of equipment for the department including a biomedical refrigerator, a floor lift, several temporal thermometers, a portable ventilator, supply and procedural carts, and Space Labs cardiac monitoring. 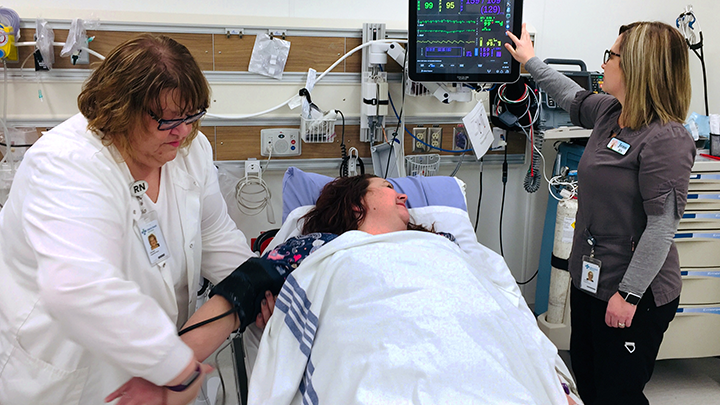 For Registered Nurse Jennifer Bethge, the Space Labs cardiac monitoring in particular has been a welcome addition. According to Bill Lawson, chair of the Wainwright and District Community Health Foundation, buying the equipment would not have been possible without generous community support. For Bethge, the support is vital to the care her and her team provides. “We wouldn’t have the things that we have without the foundation and their ability to fundraise. They truly care about our community and that’s why we need to let people know what they do for us and support them as they’ve supported us,” she says. Volk adds that the time and dedication demonstrated by the foundation is deeply appreciated. For more information on how to support the Wainwright and District Community Health Foundation, please visit wdchf.com. Visit ahs.ca/give for a full list of Alberta’s health foundations.